INDUSTRO WIPES cover a large surface area size of 55cm x 40cm, and come packaged as 300 disposable paint wipes in a convenient, portable pull-out carton that is easy to store and transport. The basis of the design behind the INDUSTRO WIPE was to offer painters a white rag replacement wiper. Something that was less bulky, more consistent in its size and absorption, smooth textured and low linting. The result was these highly absorbent wood pulp concentrated wipers, that are mixed with the right amount of polyester to give them their strength and tear resistance. The wood pulp material of the paint wiping cloths soaks paint colours and solvents instantly and is a handy low lint wiper to carry out those finishing touches. The durability and strength provided from the polyester fibres means that it can be used confidently with cleaning chemicals and solvents, without the risk of it falling apart. INDUSTRO WIPES are ideal for a variety of common tasks that arise during a paint project from wiping paint, absorbent solvents, wiping colour off canvas to cleaning paint brushes. The white colour of the wiper enables it to show up darker colours and chemicals easily, and the non-abrasive smooth low lint texture will not damage surfaces or leave traces of fibre behind after use. So, if you are looking for low lint quality white wipers for your next professional painting project, try the Painter's INDUSTRO WIPES, and enjoy the benefits that these large surface, absorbent disposable wipers offer! 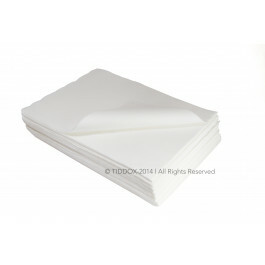 Other related products from TIDDOX 's range of painting rags, wipes and cloths include the SOLVENT RESISTANT WIPES, the WHITE RHINO WIPES and the WHITE PAINTERS RAGS.